Saturday May 4th 1878 I helped withe the work in the morning and baked a couple of cakes. As soon as the dinner work was over I started down to Lathrops. I met Mrs L going to the cemetery so I spent the afternoon at Robinsons. got home at sundown. Hatt went to town at night. Weather cool. 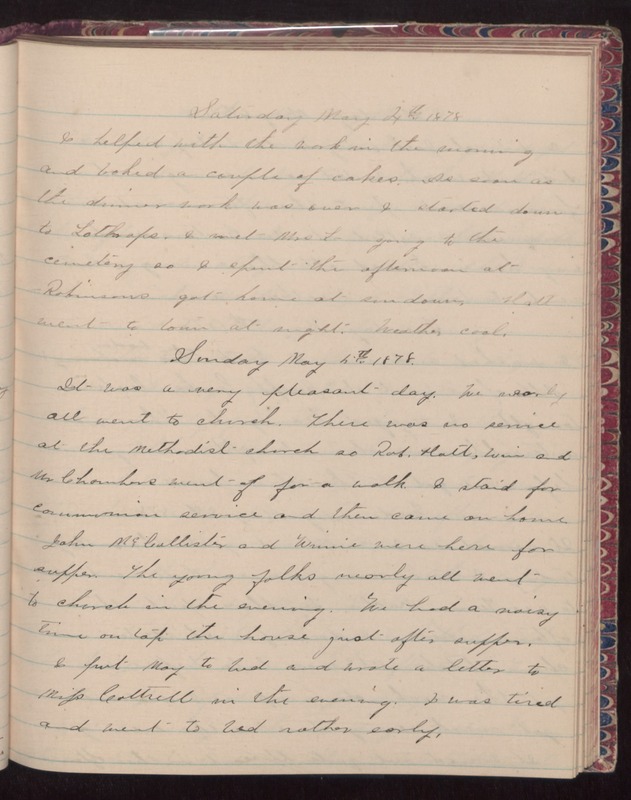 Sunday May 5th 1878 It was a very pleasant day. We nearly all went to church. There was no service at the Methodist church so Rob, Hatt, Win and Mr Chambers went of for a walk. I staid for communion service and then came on home. John McCallister and Winnie were here for supper. The young folks nearly all went to church in the evening. We had a noisy time on [top?] the house just after supper. I put May to bed and wrote a letter to [Mrs?] Cattrell in the evening. I was tired and went to bed rather early.